Attending Merrimack College in North Andover, MA on a basketball scholarship, Adam Shepard graduated with a degree in Business Management and Spanish. Shortly after graduation—with almost literally $25 to his name—Shepard departed his home state for Charleston, SC, embarking on the journey that has now become his successful first book, Scratch Beginnings. 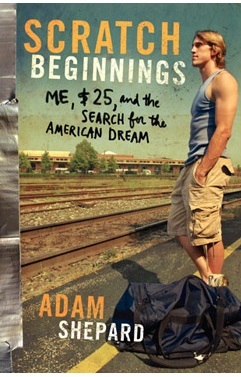 Scratch Beginnings tells the story of starting with $25, a sleeping bag, and the clothes on his back in a random city to test the values of hard work and discipline in today’s “me first, gotta have it right now” society. After a whirlwind journey that took his self-published book to the Today Show, CNN, Fox News, and NPR, he sold Scratch Beginnings to HarperCollins and made appearances on the Dave Ramsey Show and 20/20. He has likewise been featured in the The New York Times, the New York Post, The Atlantic, and The Christian Science Monitor, and Scratch Beginnings has now been used on the curriculum or as a First Year Common Read at over 95 colleges and universities in the United States and translated across the world. Manage the people around me. I’m not talented or creative, but I have learned very well how to find the people who are and then to motivate them to work hard on the vision of whatever project is on our docket at the time. My ability to delegate. Especially in my two most recent projects, I have had to draw clear lines between the business side (me) and the creative side (those around me). If we are all creative and business at the same time, everything gets jumbled. But this hasn’t been easy for me, to simply put all of my trust in the people on my team. I want to have a say in what’s going on, I want to offer my creative input, and I want to feel part of our movement forward, but at the same time, I know my role. I know that while I might be the leader, I have to step back and let the talented people do what they do. By continuing to work and play harder than literally everyone around me. Setting goals, remaining curious and learning more about your industry, being kind to people, etcetera, etcetera...every other mantra and inspirational pursuit starts with the ideal that you’re going to wake up and punch today right square in the face. Business: I love to get on stage to speak. Money comes and goes, and as long as I have my lovely wife Ivana next to me, it doesn’t matter if we’re eating at Ruth’s Chris or In-N-Out Burger. So, as long as I continue to have the opportunities I’ve had to get on stage to continue to share the stories of my life and call the millennial generation to action, I couldn’t be happier. Personal: Ivana and I would like to take another couple of years to backpack around the world before we have kids, and we have our sights set on doing that in about 3 years. The idea of purchasing water when it is readily available from the faucet. I am envious of the marketing genius behind bottled water. Every day, remarkable things are accomplished by unremarkable people. Colin Cowherd. That man has it all figured out. Seriously. New Zealand. Do yourself a favor and stop saying, “Oh, man, I want to go there.” You either do or you don’t. Set a date, 12-18 months from now, and take two weeks to go over there. It really is a beautiful country. My chromebook...best value for $200+ on the market; whatever paperback book I happen to be reading at the moment (EAST OF EDEN or anything by Toni Morrison); guacamole. Reading, writing, speaking, lifting weights, and two glasses of Cabernet with Ivana (“but not three!” she tells me).